My mother’s composition book from a banking class, 1940. My mother ended her long battle with life four years ago today. I think of her daily in one thing or another as I’m sure we all do our mothers. Though ours was a more antagonistic relationship and memories are not so fine, in my everyday thoughts I find a different story and one small theme has come back to me frequently lately. When I was little and discovering the world I took everything I found that I could carry and presented it to my mother. She rejected everything—bird feathers, rocks, flowers, small household items I’d found in the street, kittens—telling me she was allergic to the thing and not to bring it into the house. If I did, it disappeared. Years later, living in personal care, clothes I purchased for her were similarly rejected, or if accepted, would appear on someone else as she’d given them away. Fifty years of that never stopped me from trying. My mother suffered from serious depression and I think I sensed that very early on, possibly because it was particularly bad after I was born, and I had the urge to both share my wonder and to make her happy, and I also brought things I just thought she’d like. Those patterns can be difficult to shake. I’ll never be convinced that nothing I shared through life—success in college, my paintings, my artwork, my writing, on and on—got into her. Every once in a while she would slip and make a remark that proved she remembered exactly what I’d shared and why. So every once in a while, when in the course of everyday life I look something up on the internet, often read e-newsletters and my newspapers and magazines and watch movies on my computer, I think how much she would have loved the internet, just absolutely been absorbed by it. A lover of crossword puzzles, I remember her sitting in her chair working a puzzle surrounded by all her reference books, the crossword dictionaries, thesaurus, encyclopedias—old, but some information is timeless—various almanacs, world atlases and other reference books. Then there were the television shows and movies and the reference books on those subjects, then baseball, especially, and football to a certain extent, and the Olympics, and politics, and she had it all there in books and if she couldn’t relate a fact immediately she would find it. She loved looking something up, just the act of pursuing facts and finding them was exciting. So was proving someone wrong, but that might be expected. And so was voicing loud opinions and having a heated discussion about politics or music or current events, sitting in her chair in the corner of the room and not often leaving the house, indulging in early talk radio. To have all those facts and more at the click of a mouse would be exhilarating. I can picture her today constantly researching something just because it was there, and also firing off comments on Facebook, repeatedly watching her favorite movies on Netflix, and checking the weather hourly. It would be ideal for someone like her. She had lung cancer surgery and a near-fatal cardiac condition in May 2001 but recovered enough to return to her home for a little over a year, after I had begun working at home. I constantly checked on her, finding her asleep in front of Lifetime TV and a movie she’d watched over a dozen times already. Her eyesight for small print was failing and she was nearing cataract surgery, so I got her a small boom box with both cassette and CD and checked recorded books from the library for her. Same rejection pattern with those, although there were some all-time hits that she could listen to over and over and I was glad they were long ones. I had the chance, briefly, to introduce her to the computer, and did so. I cooked for her all the time, taking the food to her house in meal-size containers that could be heated in the microwave, and at least twice per month I drove her to my house for Sunday dinner, which was usually some sort of soup or, unbeknownst to her, vegetarian/vegan variations on some favorites like stew or holuptsi (stuffed cabbage) as I didn’t eat meat and she was supposed to be careful of cholesterol and such things. While here, I used my computer to show her around the internet. A computer can seem completely unmanageable to people who’ve never used one, and in 2001 there just weren’t as many computers in everyday life as there are now and most people didn’t have a computer at home, though many did at work. I wasn’t concerned she wouldn’t learn to use it. In the 80s I had taught her to drive and she got her license the day she qualified for Medicare. If she wanted it, she’d learn it. I used the mouse and, humoring me, she typed, we looked up a few things, equating that with using the index in an encyclopedia, showed her a few early online stores using JCPenney and comparing it to the catalog. Quickly enough she was frustrated by the mechanics of it and I knew I’d just have to find one moment of her discovering its potential. One afternoon she actually moused around herself and looked up a few things, and then a few facts pertinent to our conversation. Then we sent an email to my niece, her granddaughter, in Savannah GA (we are in Pittsburgh PA) and got an answer back. I could see the wheels begin to turn. Unfortunately she was regularly developing pneumonia living at home and spent some time in the hospital after that day, moving directly into personal care. She was weak for a long time and angry to be where she was, and as much as I thought about how much fun a computer would be where she lived, in that day, personal care homes did not have wifi. By the time computers and wifi were widely available it was way too late. If she had not suffered that illness and still lived at home, a computer would have been one of those gifts I would have gladly gotten for her, one that would not have been rejected, I know that for sure. She probably would have had me install it on her kitchen table where she spent time in the morning at crafts and creative things. I can almost picture here there. It may not be a memory, but it’s the next best thing. Read other essays and poetry I’ve written about my mother. When I began this blog I had intended to use it for the occasional essay; well, more than occasional, I had also wanted to encourage myself to write more essays and short stories more frequently, especially as I was in the thick of caring for my mother in her declining years. It was that very caregiving that kept me from taking the time to write. I’ve been drafting articles, and rather than go back the beginning to catch up with issues in the order in which they arose, I am beginning now. Instead, I returned the things I’d bought, capris, tops, cardigans, socks, underwear, there was always something just not right about them. Or she would accept an item, then later tell me it wasn’t right, after I’d taken off all the tags and written her name inside the collar or waistband so that it would be identified in the laundry, and couldn’t be returned. Yet I would often find her in a similar outfit that someone else had kindly purchased for her, one of the care workers who especially liked her. My mother would have been 89 years old today, July 7, 2014. We often celebrated her birthday when we celebrated July 4, with a big cookout on her beloved in-ground gas grill and later watch the fireworks. We lived at the top of a hill and could see not only our own municipal fireworks from the park below but also other displays from many other communities around us. People would often come to our street to watch the fireworks, and cars would stop on the interstate on the other side of the valley to watch the display as well, and each year we would remark on how many cars we could see pulled over onto the berm to watch and how unfair it was as cars with flashing red and blue lights would move in and make them disperse. My mother died in late January 2011 and around this time I always remember her. I wrote this poem the night she died, and first wrote this post after her memorial. I lost my mother at age 85 after so many levels of illness in her life: decades of chronic conditions and surgeries, the lung cancer ten years ago that weakened and eventually put her in personal care, the beginnings of dementia two years ago, the move to skilled nursing a year ago, the weight loss and greater need for care all leading to the last few months of decline. My mother and me in our only photo together, in our sailor dresses and our big 80s hair, 35 years apart in age. She was in the hospital with the last bout of congestive heart failure when she died. The night she died my brother and I went to her room at the nursing home to take the few possessions she had left there; I didn’t want to go back there if I didn’t need to, and I knew the next few days would be very busy. I was holding back sobs as we walked in, but words were forming in my head and when we entered I took a small scrap of paper and wrote a few of them down. That was enough to ease my heart for the moment, setting the intent, enough to get me through that and back home. My mother in her mid-70s with two of her great grandchildren. After several phone calls, a visit from a friend and more calls, I had my time alone and was up quite late. As I sat in the quiet of the night outside watching the snow gently fill the air and fall in a soft blanket on the ground, the poem came to me in nearly one complete piece. I carefully went inside and tiptoed to my desk, wrote it down slowly, line for line, all as if I was afraid I’d scare it away, all the beautiful words I’d been thinking, or maybe I’d break it, like a bubble. I changed very little in a rewrite. I had decided I would go through with my poetry reading, just two days after my mother died, because it was an opportunity to share her with others, and to read the new poem, and that I would also read it at the little service we’d have for her at the funeral home. I’ve also written a post over on The Creative Cat about this process of loss. Without further ado, here is the poem. The winter sunset shades to deep pink in the east as the Wolf Moon rises over the hill, encircled by the branches of an oak tree. The moon still looks a little hard-edged and flashed out, but at least I managed to get a little detail on it. Usually under these conditions the moon looks like a flashlight in the sky, just a hard bright circle, but it was moderated somewhat, perhaps by the branches in front of it. And I finally caught that pink glow over the horizon fading to the faded turquoise of a winter sky in the east, opposite a sunset, on a clear, cold night. I quickly shot this photo as I packed my camera equipment out of my car on my way to the paranormal investigation at Andrew Carnegie Free Library & Music Hall January 7, 2012. My family, especially my mother, had a strong tie to the place; in the houses you can see near the bottom of the photo, my mother was born and grew up in the one you can see the best, the yellow one. The Hills Conservation Network (HCN) of Oakland CA published one of my photos, “Wolf Moonrise”, in their latest newsletter. The HCN was formed after the devastating 1991 East Bay Hills fire. In a state known for wildfires this was the worst one to date in 1991, killing 25 people and injuring 52 others, leaving some 10,000 people homeless by destroying 3,354 single-family homes and 456 apartment units. The group formed to help organize efforts in restoring the scarred land while preparing for other wildfires in a way that would mitigate future damage as much as possible. They publish a quarterly newsletter, and in this case the Winter 2012 was “celebrating trees”. They would publish a poem by William Carlos Williams entitled Winter Trees and wanted my photo to illustrate. No one has to twist my arm to have a photo published along with a poem by William Carlos Williams, and while I didn’t remember this particular poem once I read it I was in full agreement, especially at the lines: A liquid moon/moves gently among/the long branches. I am also glad to help an organization whose mission I support, and those interested in carefully reforesting and restoring the land and preparing wisely for future actions. Click here to read the newsletter; my photo and the poem are on page 3. This is one of my stories of Christmas magic, a little interesting moment that really did happen one Christmas night a several years ago. As I followed the curves of the road the moon seemed to follow me on my right, a watchful presence as I drove through the deepening twilight. I had just driven my brother back to the nursing home where he was living while recovering from a traumatic brain injury, and then my mother who was living in personal care in the after effects of lung cancer and congestive heart failure. The two places were at least 50 miles apart and the journey took quite some time on both highways and back roads. I had cooked a Christmas dinner at my house, set everything aside to keep warm and gone to pick up each of them. We ate our dinner and I packed a few leftovers for each of them before getting them back in time for dinner medications. At each place I stopped for a while to help them in and to get resettled in their respective spaces and discuss their care with staff. Now I was on my way home to pack up the rest of the dinner, wash dishes and clean up my kitchen, there was very little traffic and the day had been beautiful, clear and sunny though cold and now, alone, I had some time to ponder. A small valley opened out on my right, a flood plain along a stream, a familiar thing to one who walks the woods and valleys in Western Pennsylvania: a level area filled with young trees, scrub and brambles which had recently enough been the rich bottomland field of a farm, bordered by a narrow stream, and behind that a rather steep tree-covered hill. These small valleys appeared on one side of the road then the other, and with a little traveling the valley would rise up into a hill that bordered the road while on the other side the hill would fall into a valley, up and down, the road, the landscape, the rhythm was comforting, like rocking slowly in a rocking chair. As I passed this little valley I noticed movement among the trees, probably a deer as this was the time of day they moved about and that was the perfect area for them to be having an evening meal. Though I hadn’t been facing that direction and didn’t actually see anything directly the movement hadn’t seemed to be a deer, and more by intuition than actual fact it had seemed human to me. We recognize these things without realizing, that ancient part of our brain assembling patterns and instinctive knowledge before our slower logical brain can react, and making out of the pieces something we can recognize. The fact that it might be a person was not a problem, really, the little valley was essentially someone’s back yard and it would not be unusual for them to be walking around there even on Christmas, and while I might wonder if the person was in danger or in need of some sort I would be most likely to allow them their privacy. But something about the figure had also seemed familiar, I had no idea why, probably that ancient brain reacting again, but I trust it when it does that. And even though I wanted to get back home and clean up my kitchen, I slowed down and pulled to the side of the road. If there was a possibility I tried to pursue these little ideals that arose, stopping to explore. At that time, with all the complications of my life, I rarely felt I had the time to spend chasing an illusion, but I didn’t question the need to explore this one. I had passed the valley by that time so it was now behind me, but I backed up along the berm of the road to a spot where I could see into it. That silent pale yellow moon, now nearly white, still shone on my right, risen slightly higher above the horizon than before, and shone directly into the little space lighting the snow cover to a pale silver violet and the tree trunks to varying shades of pale gray against the charcoal-shadowed hill in the background. Everything seemed still, but I detected movement flitting among the trees, thought I saw the glint of moonlight on hair, on an arm, a dress. I opened my car window and shut off my radio and then my car’s engine. If those were people moving down there, they should be crunching in the snow, but I heard no sound in the crisp, clear air. And if, instead of being the author, I was reading this and didn’t know the story, I’d be yelling, “You idiot! Get back in the car!” No, this isn’t going to turn into a made-for-TV movie, I remained alone, you are safe to read on without fear. I am cautious and always aware, but didn’t feel in any way threatened, in fact I felt safe and welcome. As I stood there, one hand on my open car door, I thought I recognized one of the figures out of the corner of my eye, and as it is with focusing on subjects in near darkness the figure disappeared when I looked directly at it. But I knew it was my mother, walking quickly and gracefully as she had done when young, laughing soundlessly over her shoulder before disappearing into the darkness. Then I saw one of my aunts, also laughing but in a conversation with someone else, typically a sour and sarcastic person but here, almost unrecognizable in her happiness. And as I stood there I saw other relatives, aunts and uncles, even ones I’d never known and only seen in photos, just a few seconds each, and all were happy and laughing and moving here and there, the little valley was full of these specters. But here they were in this magical little valley and what had made me slow my car, had drawn me out to experience it was the joy in the scene, they were all enjoying themselves, happy and laughing, something that had not always been so in real life; some of them, sadly, rarely so. Here they all were together in this little parallel universe. I had been thinking so deeply about them all as I drove in that deepening twilight under the watchful eye of that full moon, remembering where I had memories of them or simply imagining those who I’d never met. When I create a scene for artwork or writing I visualize it pretty completely and even sometimes I get so lost in these necessary alternate realities that I feel the cold or hot or wind, I have the conversation, I see the light in a person’s eyes. In that manner of visualizing, in that dusky time of day when I feel the veil of reality thin and the closeness of those who aren’t with me along with that magical moon and its light among the trees, my thoughts for those brief seconds became real, and I saw them as I wanted them to be, or perhaps as they really were without the worries and weariness of everyday life, happy to be together, happy to be alive. I will never know which it was, but I would be comforted to know this was how they would all spend eternity. She was in her bed calling for someone to do something, I’m not sure what, and it took a while for her to recognize my voice; her macular degeneration had virtually blinded her, just as her dementia had done, taking away the reality we see and feel every day and replacing it with an inferior imitation, patched together from the leftovers of memories. Visiting her at that point, just two months before she died, was not easy because she was mentally so far away and the confusion really frightened her. I appreciated any tiny kernel that could help to organize her mind, and in this case, mine as well. I did my best to take her mind from her unidentified need by pointing out the afghan, which she could barely see though I described it. 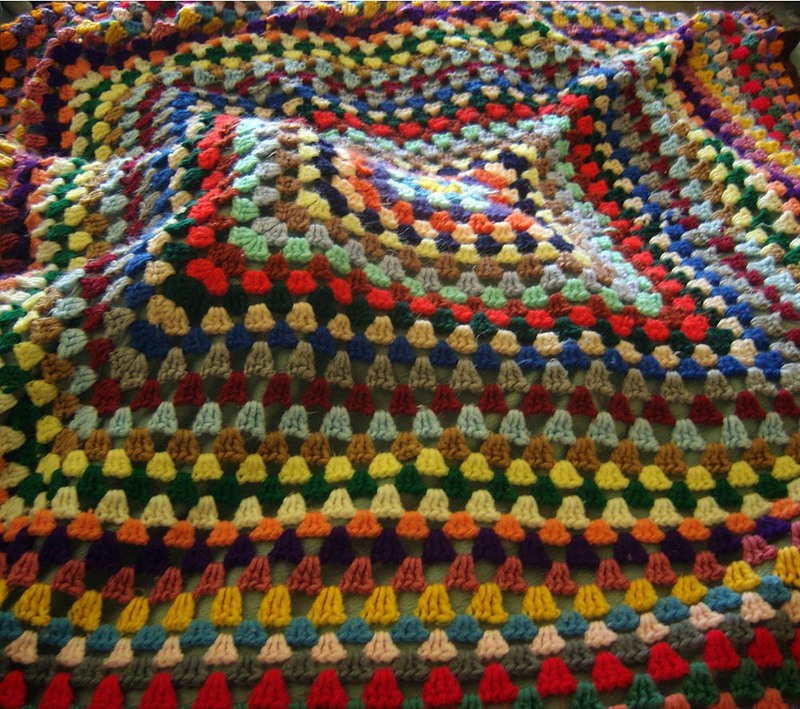 I’d made one much like it years before just as I described, out of scraps of yarn left over from afghans I’d made for sister and aunts and even neighbors, every row a different color, a different person, a different room, a different home, round and round, and gave it to my brother who hadn’t yet received one of my crocheted creations, and through many situations he kept it for years though it had ended up in her house. Pulling together those odds and ends of memory, the yarn, the afghans, the 70s, my brother, all slowly steered her to a different memory, focused on a different time, and I hoped she might spend her afternoon there. My mother died just two days before I had a poetry reading scheduled. The day she died, after taking care of much business, I went late in the night to sit on my porch swing in the dark and watch the snow fall, and wrote a poem for her and decided to go through with my reading in her honor. I read this poem as well as the dedication poem at that reading. 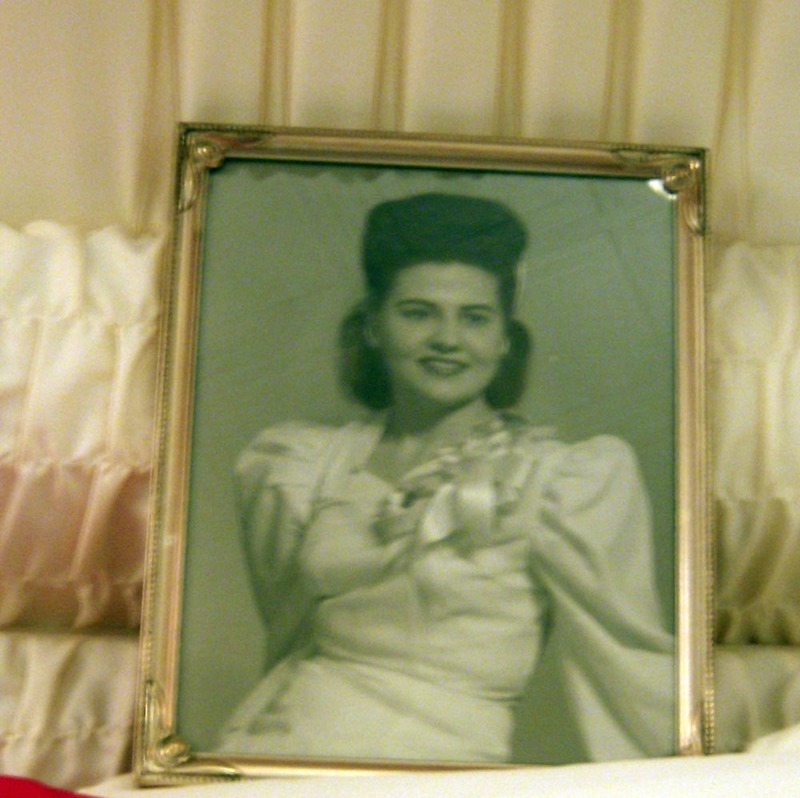 My mother died in January 2011. I first wrote this post after her memorial; today we remember her.